Art.party.theater.company did a rehearsal Tuesday sans a celebrity in the large mylar box. If you haven’t yet experienced a celebrity sighting in New York City, the STARBOX that will be displayed in Bryant Park Friday might just be your chance. 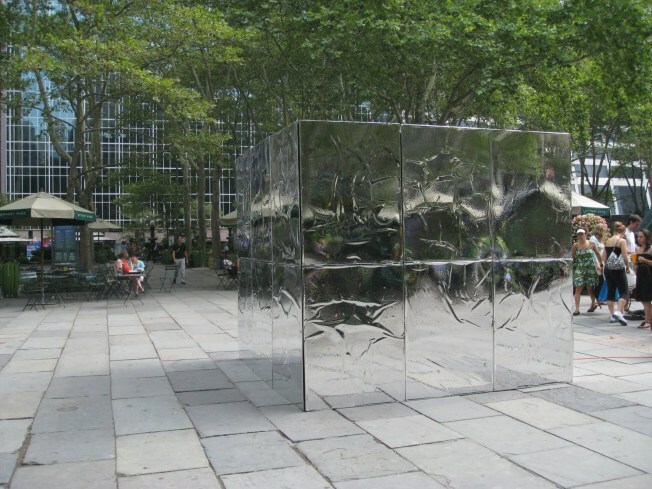 The group art.party.theater.company will be hiding a secret celebrity in a reflective box every Friday on the park’s Fountain Terrace from 6:30 to 8:30 p.m. until Aug. 13. Twenty performers will also be part of the installation. Birnbaum and the group’s artistic producer, Jess Burkle, decided to do the project after putting together “The Bryant Park Croquet Society” last year in honor of the park’s namesake William Cullen Bryant and seeing what a diverse audience the event attracted. While she did not disclose whether the celebrity will be an “A-lister” or someone lower on the totem pole, Birnbaum said that it will be someone everyone recognizes. She also officially dis-invited “party poopers” who want to run home and tell a friend who the entrapped star is. People who take a peek into the box will be signing a Non Disclosure Agreement so they won’t be able to spread the word. To keep the star from suffering dehydration and heat exhaustion organizers will be feeding him/her water and a fan will be set up to keep the air flowing. What’s the appeal for a celebrity to expose himself/herself to solitary confinement in suffocating weather conditions? “To participate in an adventure with art.party and to form a connection with interesting New Yorkers and tourists who happen to be in the park,” said Birnbaum.